In those days: God brought Abram outside and said, "Look toward heaven, and number the stars, if you are able to number them." Then he said to him, "So shall your descendants be." And he said to him, "I am the Lord who brought you from Ur of the Chaldeans, to give you this land to possess." But he said, "O Lord God, how am I to know that I shall possess it?" He said to him, "Bring me a heifer three years old, a she-goat three years old, a ram three years old, a turtledove, and a young pigeon." And he brought him all these, cut them in two, and laid each half over against the other; but he did not cut the birds in two. And when birds of prey came down upon the carcasses, Abram drove them away. As the sun was going down, a deep sleep fell on Abram; and behold, a dread and great darkness fell upon him. When the sun had gone down and it was dark, behold, a smoking fire pot and a flaming torch passed between these pieces. On that day the Lord made a covenant with Abram, saying, "To your descendants I give this land, from the river of Egypt to the great river, the river Euphrates." Brethren, join in imitating me, and mark those who so walk as you have an example in us. For many, of whom I have often told you and now tell you even with tears, walk as enemies of the cross of Christ. Their end is destruction, their god is the belly, and they glory in their shame, with minds set on earthly things. But our commonwealth is in heaven, and from it we await a Saviour, the Lord Jesus Christ, who will change our lowly body to be like his glorious body, by the power which enables him even to subject all things to himself. Therefore, my brethren, whom I love and long for, my joy and crown, stand firm in this way in the Lord, my beloved. At that time: Jesus took with him Peter and John and James, and went up on the mountain to pray. And as he was praying, the appearance of his countenance was altered, and his clothing became dazzling white. And behold, two men talked with him, Moses and Elijah, who appeared in glory and spoke of his exodus, which he was to accomplish at Jerusalem. Now Peter and those who were with him were heavy with sleep but kept awake, and they saw his glory and the two men who stood with him. And as the men were parting from him, Peter said to Jesus, "Master, it is well that we are here; let us make three booths, one for you and one for Moses and one for Elijah" - not knowing what he said. As he said this, a cloud came and overshadowed them; and they were afraid as they entered the cloud. And a voice came out of the cloud, saying, "This is my Son, my Chosen; listen to him!" And when the voice had spoken, Jesus was found alone. And they kept silence and told no one in those days anything of what they had seen. We are being transformed into his likeness "from glory to glory." That is what God is doing in us - changing us. It does not yet appear what we shall be, but we know this: we shall be like him, for we shall see him as he is (1 John 3:1-2)! God is changing us, day by day, as we allow his glory to shine in us. In the light of his glory we see things differently. The sacred liturgy - the Eucharist - is our Mount Tabor, and that's why we should never stay away! "It is a serious thing to live in a society of possible gods and goddesses, to remember that the dullest and most uninteresting person you can talk to may one day be a creature which, if you saw it now, you would be strongly tempted to worship, or else a horror and a corruption such as you now meet, if at all, only in a nightmare. "All day long we are, in some degree, helping each other to one or the other of these destinations. It is in the light of these overwhelming possibilities, it is with the awe and the circumspection proper to them, that we should conduct all our dealings with one another, all friendships, all loves, all play, all politics. There are no ordinary people. You have never talked to a mere mortal . . . Next to the Blessed Sacrament itself, your neighbour is the holiest object presented to your senses. If he is your Christian neighbour he is holy in almost the same way, for in him the Christ . . . the glorifier and the glorified, Glory Himself-is truly hidden. God's glory is hidden in us and revealed when we truly worship. Seek out God's presence, for God changes us by his glory." "On the far side of everything - the Last Supper, the campfire denial, the Resurrection, and the Pentecost outpouring - Peter tries in a letter to make sense of what happened on Mt. Tabor that day. Peter saw God's glory, and he knows it is for us. He says that God's divine power calls us 'to his own glory.' Through his promises we may 'become partakers of the divine nature' (2 Peter 1:3-4). "'Partakers of the divine nature.' The life that is in Christ will be in us. 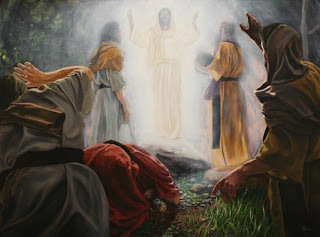 We will have a true oneness with Christ and thus we will have a personal transfiguration. We partake of, consume, the light and the life of Christ. We receive, not mere intellectual knowledge of God, but illumination. This participation in 'the divine nature' is not a treat squirreled away for the select few, for mystics or hobbyists of 'spiritual formation,' but God's plan for every single human life. 'The true light that enlightens every man was coming into the world' (John 1:9). Participation in this light is not a lofty or esoteric path, but one of simplicity and childlike humility. It's not won by sudden, swooping supernatural experiences, but by daily, diligent self-control. Through prayer, fasting, and honouring others above self, we gradually clear away everything in us that will not catch fire. "We are made to catch fire. We are like lumps of coal, dusty and inert, and possess little to be proud of. But we have one talent: we can burn. You could say that it is our destiny to burn. He made us that way, because he intended for his blazing light to fill us. When this happens, 'your whole body will be full of light' (Matthew 6:22). "Where have we been? We've been up Mt. Tabor. 'And we all, with unveiled face, beholding the glory of the Lord, are being changed into his likeness from one degree of glory to another' (2 Corinthians 3:18)." liveth and reigneth, one God, world without end. Amen.